While much attention from the U.S. foreign policy establishment is focused on Mali at the moment, Washington’s top diplomat on Africa made a compelling case to a packed auditorium at the Brookings Institution this week for why the Democratic Republic of Congo deserves a higher position on the list of strategic U.S. national priorities. 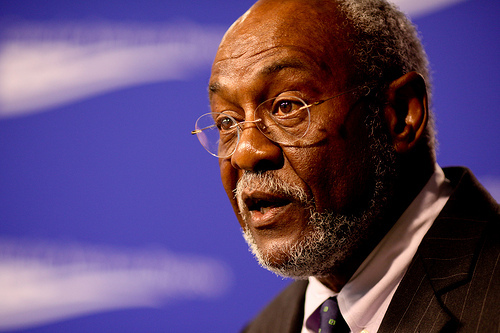 “After many years of looking at and trying to deal with a string of recurring crises in the DRC, many people have ignored or written off the country as simply hopeless,” said U.S. Assistant Secretary of State for African Affairs Johnnie Carson, speaking at an event on Monday hosted by the Brookings Institution’s Africa Growth Initiative. But to do so would be “a serious mistake” for the Congolese people, Congo’s neighbors, and the international community, Carson said. “[W]e have a stake in promoting stability and social progress around the world, and […] instability in the DRC is not cost free to the United States,” he said. 1. The sheer scale of the suffering constitutes a moral imperative to contribute to solutions in the Congo. Carson noted that more than 5 million people have died as a result of violence since 1998, making the conflict in the Congo the deadliest on the planet since World War II. 2. The Congo’s chronic instability has serious consequences for U.S. strategic interests, including the regional fight against Joseph Kony’s Lord’s Resistance Army, global energy security, attempts to address climate change, and our focus on the economic benefits that derive from regional interdependent trade, Carson said. He also predicted that a peaceful Congo could become a major exporter of natural resources, hydroelectric power, agricultural products, and even scientific research. 3. Carson identified “good fiscal and financial reasons” for redoubling efforts to address the underlying causes of the conflict in the Congo. Acknowledging other competing international priorities, Carson noted that since 2000, the U.S. government has contributed over $3 billion dollars to the U.N. peacekeeping mission in the DRC, including $410 million in the last fiscal year. The U.S. also contributed $115 million towards humanitarian efforts. Carson’s remarks suggested that a stronger commitment to addressing the underlying political concerns driving the war in the Congo could help reduce these ongoing costs. 4. Carson declared that the world cannot afford to allow Congo’s destabilizing conflict to continue crippling broader African prosperity and growth in the future. His remarks persuasively tied our broader commitment to a revitalized Africa to the situation in Congo. Although he acknowledged that Congo deserves a higher place on the U.S. foreign policy agenda Carson also emphasized the many ways that the U.S. government has been working to resolve the underlying causes of conflict in the Congo in recent years. He mentioned former Secretary of State Hillary Clinton’s decision on her first trip to Africa to focus on Congo’s rampant problem of gender based and sexual violence. The U.S. government has made accountability for perpetrators a top priority, he said, describing in particular the U.S. government’s push for the arrest and prosecution of the “FARDC Five,” Congolese army officers accused of sexual violence in 2008 and 2009. Carson also noted that the U.S. government trains Congolese soldiers on gender based violence prevention and human rights law, and has pushed the army to remove child soldiers from combat. In September 2012, then Secretary Clinton met with both Presidents Kabila and Kagame amid the deteriorating situation related to the M23 rebellion and urged them to engage in a constructive dialogue towards peace. The U.S. government also pushed for targeted sanctions against five of the M23’s top commanders, including a worldwide asset freeze and travel bans. In December, President Obama called President Kagame to remind him that any support of the M23 would be against its interests. Based on a large body of evidence and as required by law, the U.S. government suspended foreign military financing funds to Rwanda, Carson explained. If you brought a cell phone with you into this room today, you may have some of the DRC with you in your pocket or purse in the form of coltan. 1. Carson called upon the DRC, Rwanda, Uganda, and other regional actors to sign and implement the United Nations framework agreement for peace, emphasizing that merely signing the agreement is insufficient in the absence of concrete and visible action on the ground. 2. The assistant secretary called for establishing a comprehensive peace process involving regional actors, local communities, civil society, and the international community around the U.N. agreement’s principles.. He also confirmed that the U.S. government supports the appointment of a senior, high-level United Nations envoy to shepherd this process. The Enough Project has been pushing for high-level U.N. and U.S. envoys to focus on this work. Carson suggested that the U.N. should regularly report to the Security Council on the implementation of the agreement, with involvement of the secretary general. Carson suggested that the World Bank, International Monetary Fund, African Development Bank, African Union, and European Union ramp up their engagement in the process. 3. Carson argued for reform of the MONUSCO peacekeeping mission and implementation of changes to its structure and mandate. Carson publicly committed U.S. support for the planned regional intervention brigade to actively protect civilians and combat spoiler rebel armed groups. 4. Carson’s pushed for internal reform of the Congo’s governance structure. He even suggested that international assistance to the Congo should be conditioned on further reform. Specifically, the assistant secretary identified the need for security sector reform, the expansion of democratic institutions, addressing land disputes, refugee returns, the protection of minority communities, and the need for electoral changes. Carson warned, “Without such visible steps, it will be difficult for the world to continue its investment” in the Congo.